The Following post does not necessarily reflect the opinions of SFGAmWorld.com, its webmaster, staff or its readers. Following a 3 day, 3 Park trip that saw first time visits to Kings Dominion, Carowinds and of course Dollywood, I figured it was time for me to give my first hand account of Wild Eagle. Especially since in case you haven't heard, Six Flags Great America is apparently getting a B&M wingrider of their own. Situated on top of a hill in the rear section of Dollywood, Wild Eagle has a lift hit reaching 210 feet tall. with a initial drop of 130 feet. The climb up the lift hill is fast and you reach to the top of the hill in a relative short amount of time. As you see in the layout about, there are 4 Inversions to Wild Eagle, included one massive 110 foot tall loop. When I visited Dollywood recently, I rode Wild Eagle in 3 different locations on the train, to try and get a real sense of this ride. I rode Row 1 Left- Outside, Row 7 Right Outside and then Row 3 Left inside to try and get a true grasp of which row, which side would be the best on this ride. That way I can compare the ride the best ways I know and see if my assumptions of this ride all Winter where true or false. After waiting about 30 minutes for front row, I finally climbed aboard to see If I had been wrong about this ride. Immediately upon sitting down on the ride there was a trouble light that forced an immediate lift stop while we where in the station. After about 10 minutes sitting on the idle train, We took off. Upon climbing the lift, I felt an immediate feeling that I have done this before. Because toO me I had. 2 days earlier riding Kings Dominion's Dominator Floorless coaster. The course felt at least where I was seated Left Side Row 1 Outside, to be that of a Floorless coaster. Especially when going through the loop. Great Hang time on the loop, but still the feeling was more of that of riding a floorless coaster, then say an Invert which is initially what I thought it might be like. Even though the rest of the course I felt, "Hey this is pretty much a floorless coaster." Which really isnt all that bad, but nothing too Earth shattering as far as coasters go. But Granted, as is the case with Floorless coasters, like Bizarro or Dominator, floorless coasters can be very awesome rides. Following my Row 1 experience, I wanted to see if the back row of the ride would make any bit of difference, In terms of pacing, intensity or over all feel of the ride. The back row outside at least in my opinion again gave me the feel of riding a floorless coaster but of course in the back row. What I did notice this time though was through the Zero G (#3 on the diagram) the pacing seemed slower this ride then in front. Which was something I was noticing in the test videos and was especially visible during this ride in this row. But, one thing that I didnt expect however, was the decent amount of hang time through the inversions in this row. Which was something that I was happy with. While I wasn't disappointed with the two other rides I got on Wild Eagle, I wasn't exactly blown away either by them. So I decided to ride in the middle of the train on the inside seat. And I was not expecting this, but I found that this seat was not only the most "intense" (I use this term loosely) but also probably the most enjoyable ride of the 3 I had on the ride. Maybe it was due to the close proximity to the track during the ride (less then 2 feet) but this ride felt at least to me anyway of that of a Flying Coaster. It was a complete surprise to me, as I figured the ride would continue with it's floorless-esqe feel, but it surprisingly did not. 1. The trees throughout the course of Wild Eagle add nothing to the ride- All winter on forums and sites I read about how the trees will add so much to this ride. It unfortunately did not. 2. Be prepared to wait a LONG time to ride X-Flight or Wild Eagle in the busy months of the season- The load/unload process is slow, with a stretch of 4 to 5 minute intervals i noticed with waiting for one of my rides. And that does not include the trouble light that caused a 10 minute delay while I was waiting. 3. The ride really is a cross between a Floorless and a Flyer in that the OTSR vests are very similar to the of B&M Flyers, and the overall ride experience at least in the case of Wild Eagle feels at least to me like that of a floorless coaster. 4. 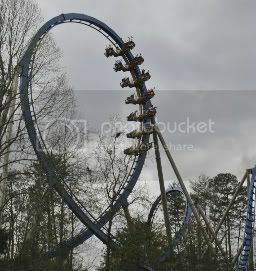 The GP Will absolutely EAT up the ride- And thats why Dollywood and SFGAm added them to their parks. 5. Wild Eagle may be the first US Wing Rider, but X-Flight will be the best Wing Rider in the US- The Layout of X-Flight based on what we've seen, will be better then Wild Eagle provided X-Flight rides like Wild Eagle does. Wild Eagle was a fun ride, nothing earth shattering, nothing to book a trip to Dollywood tomorrow over, but nothing that can be considered a bad ride as well. I think both X-Flight and Wild Eagle will be/are going to be a hit the GP much like Superman was when it first came out. Its new and something that we've never seen. Thank you for reading and I look forward to discussing this topic with you.